Wishing all of you a 2013 filled with joy, grace, peace and love! You can find my guest post, Balance, at the Minneapolis Modern Quilt Guild blog today. I know most of my readers aren’t in Minneapolis, but I think that no matter where you’re at it’s a great blog to follow. Lots of great tips and tricks! And I will wish you all al Happy New Year today, as I know the next few days will be a busy one! See you in 2013!! The 10 inches of snow we received in Minneapolis this weekend. The four people I saw biking in the city this morning, including the Skeptic and Spinner. My man obviously enjoys a challenge. Our free range Christmas tree, which looks a cross between A Charlie Brown tree and something you might see in a hundred year old Christmas scene. This tree has soul and I love it! We are using The Truth is in The Tinsel for Advent this year and we really enjoy the simplicity and ease of the projects. We are also trying a Jesse Tree this year. I love the ornaments and the message that come with this PDF. By the time I am on my third kid I should know better than to leave a four year old alone with glitter. Too many Christmas gifts. Not sure I will make it this year! Baby girl items because I have a brand new beautiful niece who is one week old today! I am Yarning Along again today. 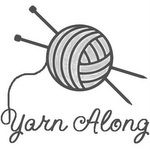 I miss seeing what knitters are doing on their blogs, there just isn’t as much these days, so I always enjoy Wednesdays. So it’s December. Am I gift knitting? Yes, but barely. I have yarn wound and patterns picked out and what I am realizing is a busy knitting schedule for the next few weeks. But I am distracted by two things. First of all, the Hexipuff. I can’t stop making them. It’s like having a bag of BBQ potato chips next to me, I just can’t stay away. And I am listening to A Game Of Thrones while I knit them. I dont’ need to follow the pattern anymore so I can just knit and listen. I don’t believe I will do an entire quilt, but I think I will be making chair cushions out of them instead. And perhaps a pillow or two. Only trouble is I thought I would be using up stash, but much of my sock yarn just doesn’t look great together, or else I started getting sick of it. So I ended up buying a bunch of mini skeins and begging for scraps in my knitting group. So far so good though, I have a decent variety now and can easily do a few chair cushions. My other distraction is way better than a pile of hexipuffs. I have a niece! A beautiful, 6lb teeny-tiny niece (compliments of my younger brother and his amazing wife 🙂 This family has been heavy on the boys genes…..not only do we have our three boys but I have four more nephews on the Skeptic’s side of the family and one sweet older niece, so it is good to have a little more girl balance in this family. Plus, my brother lives a mere five minutes from our house, so it is exciting for the boys to have a cousin right in town. So I have lots of girly knitting and sewing to show you, but I need to put on a few more buttons and weave in some loose ends.